Another great evening in the company of PLOS and I was delighted that you were able to secure a theatre slot pre-Christmas which in my opinion is so much better than the January slot. Your cast were welcomed by a thoroughly warm audience crammed full of theatrical friends and there was eager anticipation as the lights went down. It is abundantly clear that a little more time and resource is being put in to your panto production values these days. The forest cloth, cobbled streets, trees, trucks and flats etc were by no means extravagant but didn’t look as though they were about to fall over at any stage. The opening ‘Supercal…’ was excellent and truly lively with well executed strong choreography. ‘You and Me’ performed by Puss and Jack is an excellent song and kept the quality ticking over. Other numbers in the first half which I particularly enjoyed were; ‘Holding Out for a Hero’, ‘For the First Time in Forever’, At Last I can See the Light’ and ‘Tomorrow’. Act Two continued in a similar vein with a cracking mixture of comedy, panto evil and sentimentality. Big voices came through in ‘Feeling Good’ but the zenith moment was ‘Only You’ when King Vincent and Rusty took to the stage and just about stole the show. 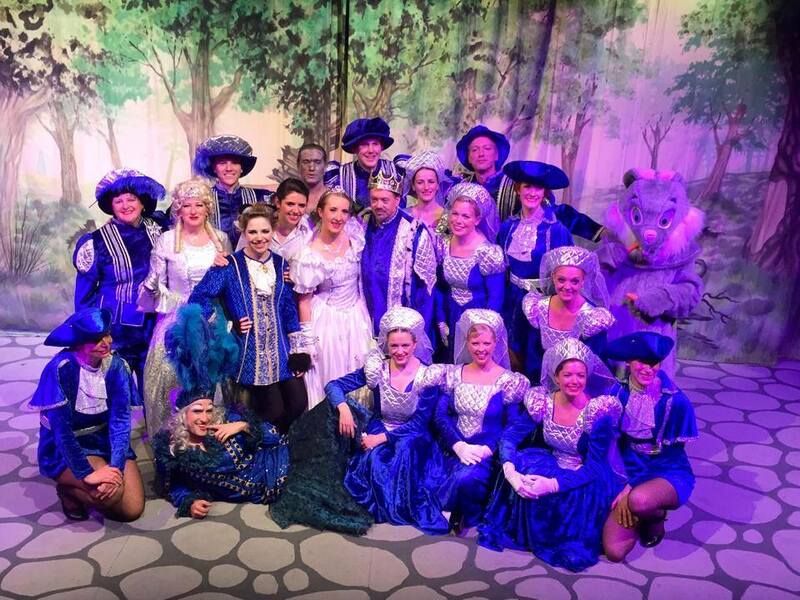 The audience loved it and along with shouting ‘We Love You Ben’ this will be my endearing memory as pure panto gold. The skill in delivering humour was also very much to the fore. This is a skill which not everyone possesses and can take time to learn. Your Dame, Liam and villain Alex have it in spades. Liam had the audience in his palm the whole time and while he spoke very quickly at times to the detriment of the dialogue, he has stage presence. Equally Alex, nearly the brought the house down with his caustic comedy remark about local theatre group Cygnet Players (many of whom were in the audience) which resulted in him being pelted with marshmallows. This production was in the hands of a strong Director, namely Patrick Harrison. Patrick added many delightful touches and seems to gel his cast together which produces great results. The music was in the hands of Musical Director Joseph Costi and his small but perfectly formed off stage band. There was a great mix of styles and pace which added much to the production. I really enjoyed the Choreography of Rebekah Clement, particularly in the first half, which was lively, vibrant and pleasing on the eye. Her lead dancers in particular performed their numbers with style and gave the production some very welcome pace and energy. I felt the Christmas medley whilst festive and entertaining was a little on the long side. Short and snappy does the trick! A minor criticism on what was an excellent evening of entertainment. Technically everything seemed to go smoothly. I’ve mentioned the opening set already and what followed was equally inviting. Stage Manager/Production Manager Phillipa Stone and her backstage team/team builders had everything under control. Jonathan Wilson’s Lighting plot was impressive and David Gates superbly handled any Sound requirements satisfactorily. The costumes came from Janet Huckle who co-ordinated the job well and brought plenty of colour and style wherever appropriate. Some new faces and some very old ones were to the fore in principal roles. Kimberley MacFarlane (Puss) was engaging and brought some feline qualities into play. Her vocals were strong particularly in ‘You and Me’ and ‘For the First Time in Forever’. Nicola Savage (Fairy Poppins) was cool and calm as the loveable good Fairy with more than a nod to the famous nanny. Liam Walls (Dame Patty Cake), all I can say is that you can’t take your eyes off of him – he’s a very cheeky chap. Lots of ad libs, lots of pulled faces and holds all the characteristics of a good dame. Deborah Lowe (Jack) sometimes Jack can be a bit wishy-washy but Deborah gave the character some real depth and sound vocals. King Vincent (Paul Aylin) tried to escape from Prince Charles but the audience wouldn’t let him with frequent shouts of Yessss. Paul rose above the good natured banter to give a sterling performance. ‘Only You’ was my personal highlight. Ross McIntyre/Penny Anderson (Hickory/Dickory) provided much of the stupid humour and the slapstick to great effect – great entertainment. Nicky Radford (Princess Rose) gave great support along with strong vocals in ‘Feeling Good’ and ‘Here I am’. Alex Donald (Franz) a thoroughly disgusting piece of work who was not difficult to loathe. However with all baddies, he had his high points but was ultimately taken down. ‘Fancy’ was a delight. A nice mention now for Ben Waterhouse (Roger/Rusty) normally an unsung on-stage hero but had his moment in this panto and it would’ve brought a tear to a glass eye. Chris Jones and Matthew Garratt also provided solid back-up in a couple of roles. All dancers and villagers provided great support to enhance the overall production – well done all! The A5 Souvenir programme was well compiled including biogs and pics are always very welcome. Thanks also for the NODA mention, it really is appreciated. I liked the in rehearsals photos and the comprehensive Director’s Notes which gives all the background information to an unsuspecting public. Once again thank you for inviting me to the Putney Arts Theatre and best wishes for this year’s main production ‘Sister Act’. Fairy Poppins is in trouble – the evil ogre Franz has stolen her wand, and she’s left with just a potion that will make an animal talk. Luckily for Jack the miller’s son, she chooses his cat, and soon we are on a magical journey which will see Jack fall in love with a beautiful princess. Will Puss’ wit and cunning be enough to convince King Vincent that Jack is a worthy husband for his daughter, the radiant Bethany? Will Puss, Jack and all their friends be able to out-wit the terrible ogre, who has stolen the Fairy’s wand and used her magic powers to capture both her and the princess? And what role will the village baker Dame Patty, Jack’s brothers Hickory and Dickory and Roger the Rabbit, play in trying to ensure good conquers evil? All will be revealed in Puss in Boots, another fun-packed, traditional family pantomime from PLOS.